There’s nothing more relaxing than a #spacation, and what better place to do so than on a tropical island? 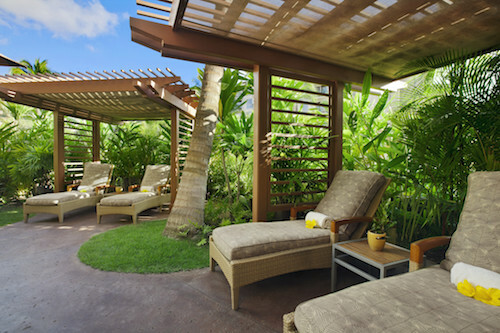 If you’re looking for the most pampering, relaxing spa treatments on Maui, we’ve got you covered. Check out our fab guide below. LomiLomi Massage: I discovered this treatment during my last trip to Maui when staying at Travaasa Hana. Unlike a regular massage, the Hawaiian style Lomilomi massage incorporates rhythmic, flowing massage strokes and intense kneading via hands and forearms in order to “open the body and soothe the soul” — a traditional method used for healing in Hawaii. You’ll feel rejuvenated and refreshed, and plus, you can’t beat the serene spa location. 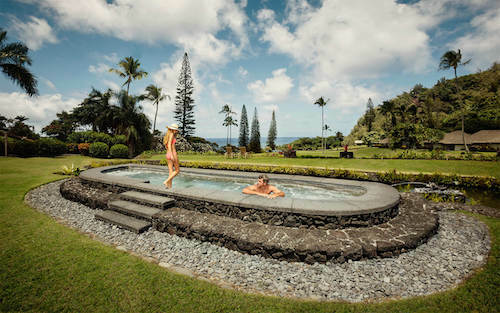 Editor tip: Grab your robe and make sure to cushion in time for the outdoor lava rock whirlpool with unobstructed views of Hana Bay after you’re done getting pampered. The resort is nestled in a tropical setting, so it’s definitely a one with nature experience. Pamper Me In Paradise: This ritual starts out with a full body sugar scrub to get rid of dull, dry skin, and then moves on to a “cocoon” of nourishing coconut, macadamia nut, and kukui nut oils (my favorite part!). And that’s not all. It concludes with a mini facial, and a foot and scalp massage. I now get why they call it the Heavenly Spa. 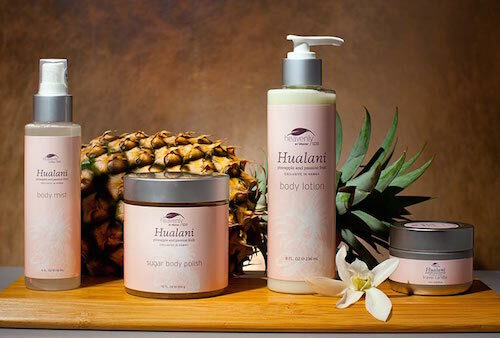 Editor tip: Scoop up some of their exclusive Hualani (meaning “heavenly fruit”) — body products infused with locally grown island pineapple and passion fruit. You won’t be able to say no after smelling them during your treatment! Awa Remedy: After a long day of fun in the sun (I know, #toughlife), check yourself out of reality for 90 minutes and indulge in the tension-relieving ‘Awa Remedy treatment. It showcases products from Ala Lani, my favorite local Hawaiian beauty brand, and consists of a full body exfoliation via sea salt scrub, ‘awa aloe body wrap, foot massage, and scalp massage. If you can bring yourself back to reality afterwards, the experience showers are a must. Editor tip: Arrive early so you can take advantage of the complimentary pālolo bar (aka mud bar) and hot lava stone foot bed, and don’t leave the spa without a tub of your very own Ala Lani Tropical Citrus Salt Scrub. Ocean Ritual: When this treatment was first described to me as a “sensory aquatic journey,” I knew it was a clear winner. It entails three steps: a full body scrub, dead sea salts warmed in a fabric pouch and massaged on the body, and a fun tingling algae mousse wrap. Ocean Memory Cream, a top-selling product, is applied all over to moisturize the skin. Editor tip: Post-treatment, grab a cup of tea and head to the outdoor spa area with a magazine or book for some extended relaxation. Deep Sea Facial: This luxe facial is ideal for reviving your skin post-sun. The esthetician creates a tailored facial that includes deep cleansing, exfoliation, and a face mask. To top it off, you’ll receive a facial massage with warm and cool stones, and a scalp and foot massage. Say hello to a youthful glow, island style! Editor tip: Book a room for a couple nights, as it will be hard to tear yourself away from the outdoor treatment room! Travaasa_Hana FabFitFun LomiLomi is the best!